More recently we have been having quite a few older adults join our personal training studio with their goal being “ I want to get stronger”. We now train at least 10 people aged over 55. The interesting thing is the people who have been training with us consistently for years, who are over the age of 60 seem much younger than the 60+ year olds just starting out. The comparison is not even close. SO WHY IS THERE SUCH A DIFFERENCE? Is it just because they had been exercising? Well, this depends on the type of exercise because we also found that the clients who were still active in their old age but were doing more cardio type activities and not weight training suffered from more postural and injury related problems and had the same appearance as the non-training older adult! Only the people who had adopted a good weight training program appeared much younger than their counterparts and suffered less injury, were more active and were leading a life similar to some 40 year olds. Notice I underlined the word good and there is a valid reason for this that I will share with you later. In summary as the population continues to increase with age there is a dramatic increase in the % of people with disabilities, injury & other related health problems that could be prevented by adopting strength training in combination with healthy nutrition and lifestyle habits. If there is one thing that we need to live a productive and satisfying life well into old age it is functional capacity. What is quite interesting is that it is also what most older adults want. We rarely get a 65 year old saying, “I want ripped abs”. It is usually “I want to be able to walk up the stairs without having pain in my hip or feeling like I am going to fall over”. Basically, our older clients ALL want to be able to do what they want without fear, limitation or pain. That is, they want function and only a Functional Strength Training method program in combination with nutrition and lifestyle components can achieve this. 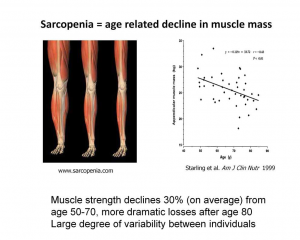 The loss of muscle mass with advancing age, which is called sarcopenia, is an important factor to address because it can have a dramatic impact on functional capacity. Look at the picture above and closely at the legs on the left. The first one is the leg of a healthy, active person with a high level of functional capacity. They have worked to maintain their bodies through regular physical activity and exercise. Because of the strength and power they have, they are easily capable of getting out of a chair, climbing stairs, hiking, playing tennis, gardening and many other necessary and enjoyable activities. This is typical of one of our clients who has been doing weight training for years. The leg in the middle is a person we regularly see. They have not been as active as they could or should have been and maybe only participated in random exercise throughout their life. Because of this they have lost an average amount of muscle mass and strength. They still can perform most activities of daily living without too much difficulty yet more vigorous and strenuous tasks are no longer possible. They have therefore modified their lifestyle so that they do not have to do these activities anymore. For example, they stopped playing tennis because they just couldn’t keep up with their doubles partner or they changed houses to not have to walk up the stairs anymore. This person has a little difficulty even getting off a chair or getting up off the floor and need to find a way to use chairs or something around them to give them a little extra boost. They have lost a good deal of functional movement skills just to live an ordinary life. These people are potential candidates for needing assisted living and are at risk of further decline into disability. The third leg shows someone who has lost a considerable amount of muscle mass. So much so that they are no longer capable of performing all of their activities of daily living. Now just simple movements such as bathing, toileting, shopping, working, dressing and other tasks have become hard and they need help with some or all of these. This is the rehab client we would get who needs a lot of support to just do simple movements. We see this leg in people aged in their 40’s! 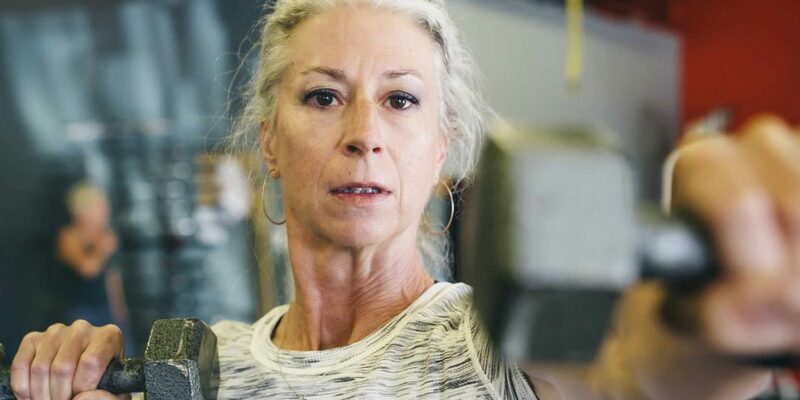 There have been many studies that have demonstrated the capability of people as old as 100 years to build muscle through high-intensity resistance training. Even with all of these studies being completed many people still think that older adults are incapable of regaining muscle and strength. Some still think that lifting weights is dangerous. However we know that weight training for preventing sarcopenia and building muscle mass is essential for improving function and avoiding disability. However, many people are misinformed and believe that they are too old to go the gym and are even told so by many of the so-called experts. There is a real fear around exercise for the elderly. But injury due to their clients lack of stability and strength is in fact a real possibility. As is using poor methods such as machines and isolated body building methods to improve strength. Which although they may achieve the goal of building muscle, these movements do not improve the function of their clients, meaning they do not improve the way a person moves in real life. Technique is everything for this client as disaster awaits for the person who uses bodybuilding techniques or tries movements that are dysfunctional and not relevant to the client’s goals. Remember I said earlier that only the people on a good strength training program showed great results. What I really meant was, only those on a functional strength training program showed great results. For example, being bolted to the floor and pushing a weight plate with your legs (Leg Press) does not teach the body how to stabilize the spine, pelvis, knee, and ankle in a standing position like a squat does! If anything, it teaches your body to become dysfunctional as it now it thinks it does need stabilizers to lift heavy objects. This can be disastrous for new clients. To build Core Strength you need to develop movements in a standing position that activate stabilizers of the body. 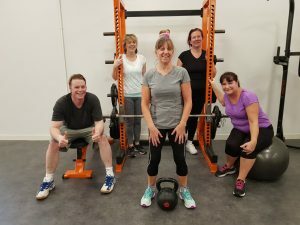 A perfect example of an older client who can perform many exercises by adopting functional training techniques is Denise. She can comfortably Squat with an 18kg kettle bell, walk down the running track holding 10kgs in either hand, perform many complex leg movements such as Dead Lifts and Swings and she has even learned how to perform a Clean and Press with 12kg weight. 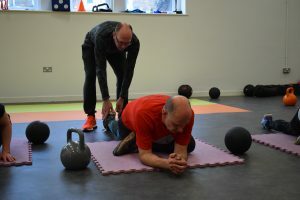 Despite the fact that she has arthritis in her knees and hands, Denise completes 3 x 1 hour Functional Strength Training sessions per week and has done so for a long time. As you can see this is her secret to not only staying in shape but maintaining great function to do the things she loves. So, if you are not strength training now, get started because it is never too late. And if you would like to arrange a Free Consultation to find out more about our Stronger For Longer Classes fill in the contact form below and I will get back in touch with you within the next 24 hours. 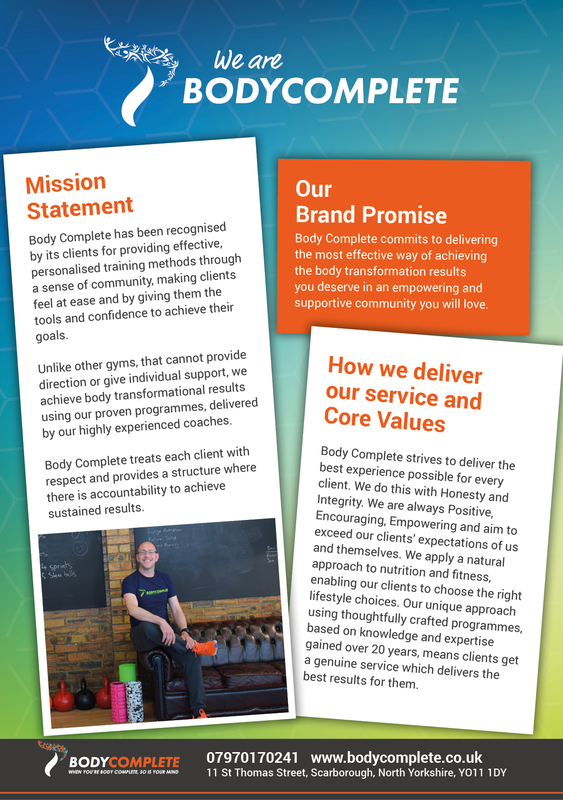 BodyComplete Fitness Solutions has been recognised by Sainsbury’s as the leading health & fitness provider in the area. 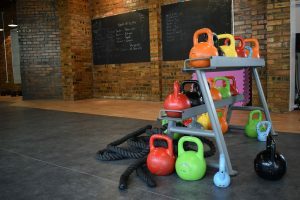 Their unique fitness and nutrition programs are designed to help you reach your goals fast in a supportive, fun and inspirational environment.